There are 5 figures of Snow Queen in the nest. The scenes from the famous Hans Christian Andersen fairy tale "Snow Queen" are depicted on the dolls. 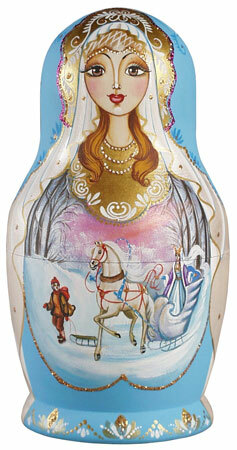 This exceptional HAND PAINTED ART Nesting Doll was created out of birch wood in Russia. Bigger figure opens up to fit the smaller one inside it. It takes a lot of time to make these dolls. The tree was cut in spring, stripped of its bark leaving a few rings to prevent the wood from cracking when dried. The logs were dried and kept in the open for several years. The logs are then cut into smaller pieces. All the operations do not involve any measurement and rely on intuition and require great skill. After the turning work on a lathe is done the dolls are cleaned, primed with starchy glue to make its surface smooth, polished and now are ready for painting. After having been hand-painted they are dried for several days. 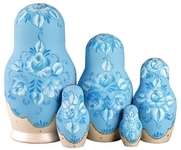 The lacquer is not applied on these dolls.